Get on up and dance to the music! It&apos;s hard not to appreciate the Nissan GT-R. Granted, it&apos;s a supercar killer performance-wise but its exterior design somewhat resembles that of an electric shaving razor. 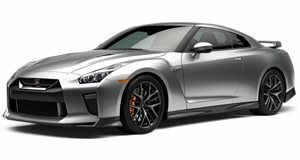 Powered by a turbocharged 3.8-liter V6 that pumps out 545hp, the GT-R has become legendary in its fearless ability to take on the likes of the Porsche 911 Carrera S, Audi R8, and the Jaguar XKR-S. Ok, so there&apos;s a pretty good reason to celebrate. But do you celebrate like these guys? This GT-R was spotted in Dubai when its owner and some of his friends just suddenly started dancing on the street. Apparently they began doing this not long after they had a short race between the GT-R and another guy&apos;s Camaro. Hey, sometimes a GT-R and a Camaro just make you want to dance.